As a bit of introduction to those who are just seeing this. My house suffers from my horrible habit of letting “stuff” accumulate. 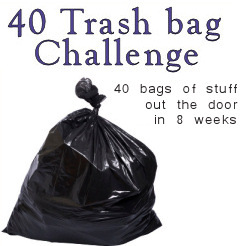 I started the 40 trash bag challenge to help me focus my de-cluttering efforts and to provide a bit of accountability while I work away at the “pile”. I am using standard size kitchen trash bags, I am also figuring that one “book box” is the rough equivalent to a bag since some things just don’t work well in bags. Willa has started the Trash bag Challenge. She is in the process of organizing her home and it is an inspiration to see the before and after pictures. Mary Alice has started working on eliminating some of her excess stuff. If you are doing the Trash bag Challenge and want me to link to your site so you can inspire others please leave a comment or email me. 40 of 40 bags so far. The last bag — A bag of bags and shoes. Week Eight: The finale week. After letting myself fall a bit behind can we make it? We’ll see. So far so good. I really started on the children’s clothing. One bag of little girl things. I hopped down to the basement to pull up the summer clothing boxes. After sorting through three of the boxes I have one bag. A bag of toys. Mostly things like happy-meal toys and little things they get here and there and play with for a few days then never look at again. A box of books. I mean serriously I don’t think I am going to need Weddings for Dummies any time soon, and that Introduction to Microcomputers published in 1987 might not be so useful today. A bunch of stuff from the office supplies storage shelf. I tossed a bag of old coloring books and other assorted papers from the kids play area. A bag of broken toys, old drawings, broken crayons and other “trashed” play things. One bag of little boy things. A bag of toss away stuff from the boys room. Week Seven: This is another catch up week but we are off to a good start. Another bag of towels from the bathroom linen closet. My mom got me new towels for my birthday but I never got rid of any of the old ones. A bag of linens and towels from the bathroom linen closet. Yet another bag of stuff from the the office. I hang on to way too much paper, and I need to remember that junk mail will in no way be less junk just because it is a month old. A bag stuff from the the office, mostly paper and old books. Another bag stuff from the office. Old notebooks, paper, and some random things that were lurking in a couple boxes. + Two computer towers and two computer monitors (counting these as two bags because of the space they were taking up in the office). A bag stuff from the living room and office, mostly paper. I have moved into the kitchen. Lots of discoveries — like the box of bottle liners I haven’t used since Christopher was a baby. More expired stuff. A sack of mis matched stuff from several closets and the kitchen. A bag of trash from the bathroom. A bunch of stuff like expired medicine and sunscreen. Another bag of empty bottles and such from the bathroom, plus some things I have no idea why we kept. Broken hair clipper? A bag of totally useless paper from the office. One bag of toys, mostly stuffed animals. More stuff from the linen closet. Why do I have standard sized sheets and no standard sized bed? A bag of sheets and baby blankets from the linen closet. And finally the last bag of stuff from my closet (for now). A bag of papers from the office. And another bag of stuff from my closet. One more bag of stuff from my closet. Yet another bag of stuff from my closet. A bag of stuff from my closet. Yet more things I haven’t worn in next to forever, I even found some things I didn’t remeber owning. A bag of mostly children’s clothing that are either too small, too worn, or that I never liked well enough to put the kiddos in. I hit Rachel’s drawer and got a bag and a half. The second half bag was t-shirt and worn sweatpants from the closet. One whole bag of shoes. Sounded impossible, but no. There are still more shoes that need to go. Thanks! I always do better with these household projects when I have some sort of company. I keep forgetting that my wordpress account doesn’t have my real name — this is Willa. Congratulations! What an undertaking, and you are doing well!! Are you taking some before & after pictures (and as-you-go pictures?!)? I haven’t been so far. After the de-junking phase I will be reorganizing and I might well take pictures then. You are currently reading 40 Trash bag Challenge: update as I go at Simply Catholic.